Queensland Baptists’ outreach, Carinity Education, is placing its disadvantaged students at risk by refusing to agree to arbitration over long-running negotiations with staff. 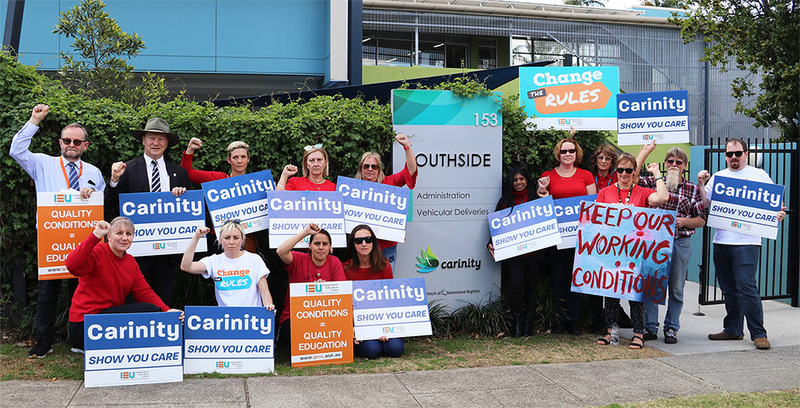 Carinity teachers and school support staff will rally alongside community supporters in Sunnybank and Hervey Bay at 8:00am on Tuesday, 18 September 2018. Independent Education Union (IEU) members will take strike action during scheduled work hours to attend the rallies and pass formal resolutions calling on Carinity to agree to arbitration of the negotiations, which began in June 2017. IEU Queensland and Northern Territory Branch Secretary Terry Burke said throughout the negotiations, Carinity has remained wedded to an agenda of cuts to community-standard working conditions including superannuation, long service leave and redundancy provisions. “Teachers and school support staff in Carinity schools have rejected the employer’s unfair attacks on their working conditions at every opportunity. Mr Burke said the negotiations had reached a critical point where intervention from the independent umpire was essential. “It is the unfair nature of Australia’s current industrial rules that workers have limited power to fight obstinate employers who are intent on cutting conditions,” Mr Burke said. Mr Burke said while broken industrial rules meant employees could not force Carinity to agree to arbitration, the employer should have nothing to fear from the intervention of the independent umpire. “Carinity has repeatedly refused members’ calls to refer this matter to the Fair Work Commission for arbitration, instead hiding immovably behind an agenda of cuts. Carinity operates four schools in Queensland (Sunnybank, Hervey Bay, Rockhampton and Gladstone) which largely cater for disadvantaged youth. Despite claiming the word Carinity to be derived from the words ‘care’ and ‘affinity’, Mr Burke said the experience for staff during negotiations has been the exact opposite. A community petition in support of Carinity teachers and support staff has reached 1,600 signatures. •	Negotiations between Carinity Education – an outreach of Queensland Baptists – and employees commence in June 2017. •	Carinity operates four schools in Queensland: Southside (Sunnybank), Glendyne (Hervey Bay), Rockhampton and Gladstone. •	Employer’s Log of Claims contains significant cuts to existing working conditions including superannuation, leave and redundancy, as well as changes to staff classifications. •	Employees’ Log of Claims seeks to retain all existing conditions and attain conditions which have become community-standard in the education sector, including paid domestic violence leave and contemporary parental and spousal leave. •	Carinity rejects claim for paid domestic violence leave despite the organisation publicly promoting its broader work in this area. •	Carinity tables a proposal that would see experienced teachers earning more than $8,000 less than their counterparts in state and Catholic schools. •	Members begin protected industrial actions in November 2017 in response to the employer’s ‘take it or leave it’ approach to the negotiations. •	Protected actions include: not attending meetings of staff; banning others duties during scheduled planning, preparation and correction time (PPCT); banning recording and transmission to the employer of student results (not including Year 12 students or those leaving the school); and delaying responding to emails (not related to health and safety or child safety) for up to 30 days. •	In late November, Carinity puts an agreement to ballot that would see conditions diminished – a majority of employees vote NO. •	Members strike for one hour on 29 November 2017. •	Negotiation meetings resume in February 2018 – members suspend protected actions awaiting the outcome of the first meeting. •	Employer continues agenda of cuts to community-standard conditions. •	Members contact Queensland Baptists Board and all Queensland Baptist Ministers outlining their concerns about the negotiations. •	Protected actions recommence in March 2018. •	Members strike for the second time for one hour on 24 April 2018. •	Employer will not provide reason for cuts, but maintains cuts are not due to financial concerns. •	Employer and employee representatives attend Conferences in the Fair Work Commission on 23 May 2018 and 6 June 2018 – the Conference is not arbitration and does not bind either party to outcomes. •	The Conference fails to produce real outcomes as employer refuses to abandon cuts to conditions. •	The employer ballots a second proposed agreement; employees overwhelmingly reject the proposal with 77% voting NO. •	Members strike for a third time, stopping work for four hours on 30 August 2018. •	Members again urge the employer to agree to arbitration through the independent umpire, the Fair Work Commission, and announce a community rally and fourth stop work for 18 September 2018.